Speculation in stamps has a long, varied and interesting history. 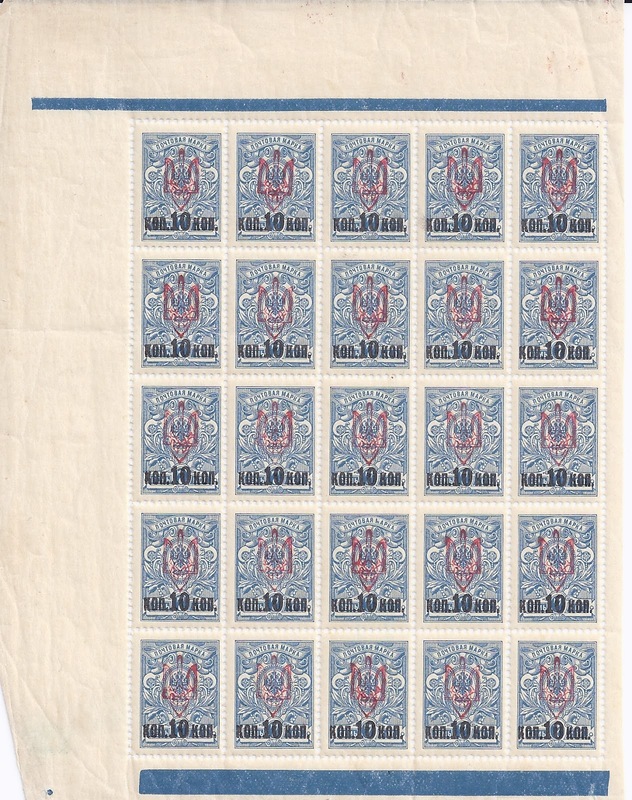 One way to speculate is to “issue” stamps, with enough control over the issue to be able to benefit financially from sales of the stamps and any essays, proofs and errors with which you are able to enhance the enterprise. It helps to be a printer, or have ready access to one. 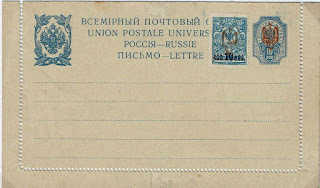 It helps to have some connection to a recognisable postal or a quasi-postal authority which might provide authorisation or at least give cover of some kind. It helps if there is a credible-looking (but probably false) document giving Numbers Printed. And, if you are really serious, you will want to persuade the publishers of stamp catalogues to list your product. In the past, they often did. 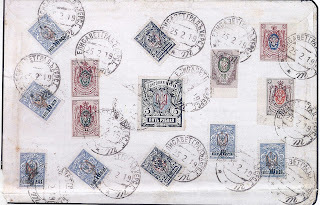 Finally, you might like to see the stamps on covers with genuine post office cancellations, something which in the past and even now is not so hard to arrange. The Tridents linked by name to the city of Kherson are certainly a speculative stamp issue, but one which is still in the catalogues and reasonably popular. But we don’t know for sure who all the speculators were. We don’t know who printed the stamps or where they were printed. 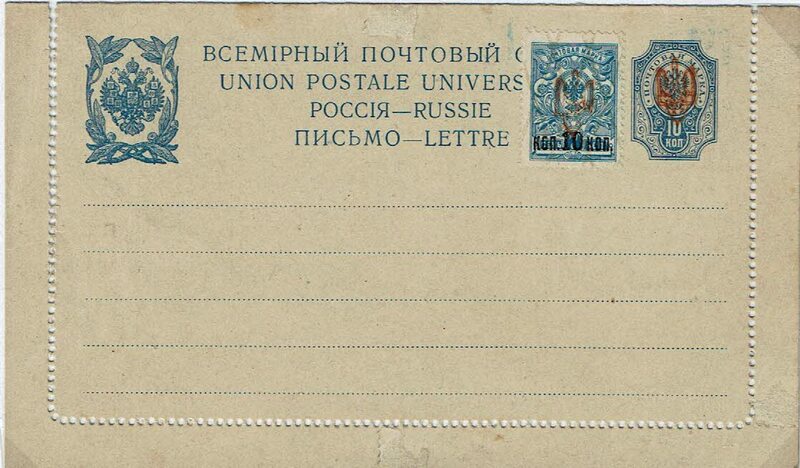 We do know that it was in the Kherson postal district that someone (just one person?) put them on Registered covers which travelled through the post. And we can be pretty sure that the Numbers Printed given in John Bulat’s catalogue are bogus, just as they are bogus for the Courier Field Post and Ministerial tridents – two other speculative issues. There are just too many copies of the stamps around for the numbers to be credible. 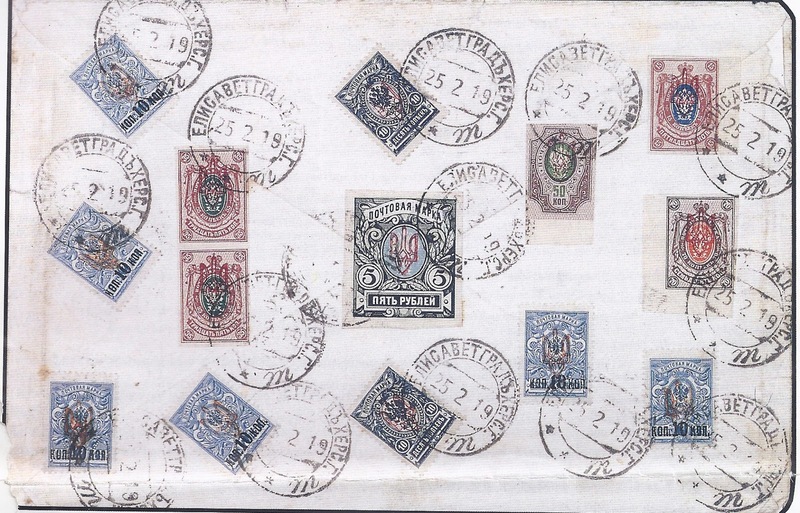 Very recently in The Ukrainian Philatelist (issue 112), Peter Cybaniak – who may well have the largest collection of the Kherson Tridents – makes the same attribution but writes of the “Corps of the Ukrainian Legion” – also Hetman period – and reckons they were prepared at Bila-Tsverka, just outside Kyiv. He then explains the fact that - unissued in Kyiv - they turn up only in Kherson district as a result of an onward sale – precipitated by the fall of the Hetman and the assumption of power by Petliura’s Directory. The onward sale put them into the hands of another speculator, Rutkovsky, who was based in Kherson. He in turn sold the bulk of his holding to the London stamp dealers Bright and Son in November 1920 (a date which coincides with the final evacuation of white forces from the Crimea). The rest is history. So we have a problem. How is this level of disagreement and uncertainty possible? Part of my holding of Kherson Tridents is in mint multiples which came to me with that part of the Vyrovyj collection which I purchased. I have always just assumed them genuine on the basis of that provenance. So I looked at the backs in good natural daylight and ended up with two groups – some with no signs of an impression on the reverse - therefore must be Lithographic; some with clear reverse impressions – therefore must be Typographic. I looked at the fronts of my multiples: no obvious differences in form of the Trident or colour of the ink. From the front, they all look genuine. Pateman (2015) – Printed with care from typographic plates. In order to avoid ink spreading and filling the fine outlines of the tridents, the printing plate was lightly applied so that there is often no impression on the reverse visible to the naked eye. There must have been two plates, one for kopeck and one for rouble values. One further point: Shramschenko, who one must remember is an unreliable witness, nonetheless makes the useful observation of the overprints that “In most cases they show through clearly to the back” though it is frustratingly unclear whether he is referring to the colour (which he has just been discussing) seeping into the paper- which it often does - or whether he is referring to the raised typographic impression. Ah Kherson....they are such attractive Tridents that everyone really wants them to be genuine! 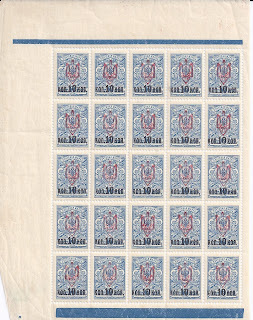 At one point I think I had half a dozen of more-or-less dodgy covers with them (which I think ended up with you) but I've never seen the ultimate proof of postal use: their use on a postal form, such as a money order or parcel card. I bow to actual Ukraine specialists in this matter but until one of those turn up I tend to agree with you that they're speculative nonsense.